In order to achieve the best performance, the most effective parts and systems must be in place. For fluorescent lighting in particular, this extends beyond the bulbs you choose and can center on the ballasts used to control voltage. At Cors Lighting, we offer some of the best fluorescent light ballasts and kits available at the lowest prices online. We offer electronic ballasts for light fixtures that are simple to replace and offer top-quality performance. Available for all T5 and T8 lamp fixtures, our ballasts are sure to contribute to lighting solutions wherever fluorescent lighting is installed. Furthermore, for those converting from T12 bulbs to T8 bulbs, Cors Lighting will gladly answer all questions concerning rebate offers from power companies. 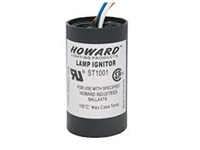 Browse our selection of kits and items from the renowned Howard Lighting company including all metal halide ballasts, electronic ballasts, compact fluorescent ballasts and more! Call 217-806-0502 for a quote or consultation today. We offer bulk buying discounts plus FREE shipping on all orders over $99! At Cors Lighting, We Light It Up!